To help me get ready for the H.G. Wells Sourcebook I am going to write for Steam Tour: An American Steampunk in London, I decided to read several of his scientific romances. I read the Time Machine and The Island of Doctor Moreau several months ago, but it is always interesting to read an author’s whole canon in quick succession. My goal is to read War of the Worlds, First Men in the Moon, Tales of Space and Time and The Door in the Wall at minimum before the ezine comes out, but if you think I am missing something even better than what is on that list let me know! My experience with War of the Worlds was a bit backwards, because I read League of Extraordinary Gentlemen Vol. 2, and the events of that book are closely related to Wells classic tale, and very faithfully adapted it turns out. Like many of Wells books, this story started as a serial in magazines rather than as a novel from the beginning. The serial ran during 1897 and it was later compiled into a book in 1898. It is divided into two parts, The Coming of the Martians and Earth Under the Martians. 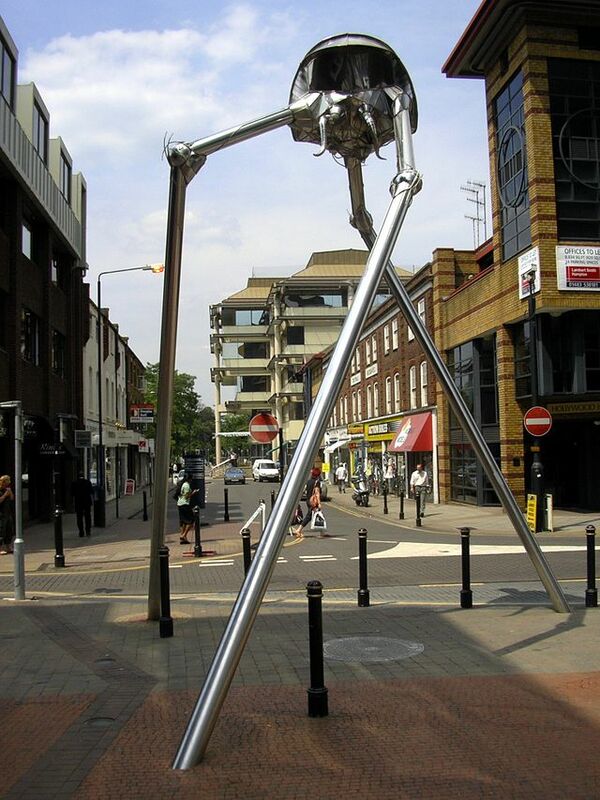 The name of the Surrey-based narrator is never revealed, and he tells the harrowing adventure through his eyes as well as through his brother’s account of what happens to London itself when Martians descend and start an invasion. One thing that I love about Wells stories is how much of the scientific knowledge of the times he includes in his tales. For instance, the arrival of the Martians is preceded by strange explosions visible on the surface of the red planet, and it takes the Martian pods several weeks to arrive to the outskirts of London. It then takes over a day for the metal to cool down enough for the pods to open. In the meantime, people have started to gather and even sell refreshments around the first pit where they crash-landed. I love that detail, and I absolutely believe it would happen that way. Soon, the festival atmosphere turns to terror when the Martians assemble their deadly heat ray, our narrator only escaping because he had been sent on an errand and was not in the pit with the scientists who first try to make contact. 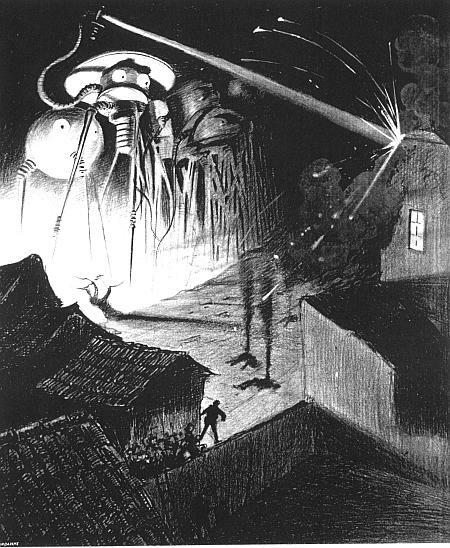 Through a series of near-misses and some quick thinking, the narrator survives the first wave of attacks by the be-tentacled Martians and their huge fighting machines, and tells the story of (in his view) the apex of society falling to pieces in the face of a cold and calculating enemy. He is surprisingly pragmatic about the whole affair, often likening the human race to insects or rodents who are disturbed by the machinations of people. This is not true of most of the people he meets on his way though, and there are several different kinds of madness worked into the narrative. This is a tale of invasion, but also of devotion between a husband and wife, which took me by surprise. I have only just started to look at Wells personal life, but he carried on a number of affairs during his second marriage after divorcing his first wife, so the commitment shown by the narrator seems inconsistent with what I know of the author. I can definitely see why this book has been adapted and re-adapted several times and in different media. The aliens and their technology remains alien and stands the test of time better than say, First Men in the Moon. It is definitely worth a read, not just because it is a classic but because it is a genuinely interesting social commentary that transcends the time in which it was written. Have you read it or seen a movie version? What did you think?